Cyprian Norwid was born on 24 September 1821. A poet, writer, painter, sculptor and carver, he lived and worked in Poland, Italy, Germany, the United Sates, England and France. An emigrant, enduring extremely tough living conditions and receiving little support from his peers, he died alone in the Polish retirement home located Rue Chevaleret in Paris, on 23 May 1883. He now rests in the Polish cemetery in Montmorency. Only after his death was his work published and studied. From then on, he was seen as a talented artist and one of the greatest Polish authors. Cyprian Norwid’s work is in great contrast with his romantic elders whose verbalism and pathos he finds irritating. His philosophy is based around collective effort, as opposed to the individualism of the Romantics. His ideal is the craftsman artist, who combines physical effort and productivity to achieve Beauty. His artistic and spiritual ideal is in the idea of a necessary union between art and useful effort, between beauty and work. – work, to arise once more. tanned from toiling the earth. 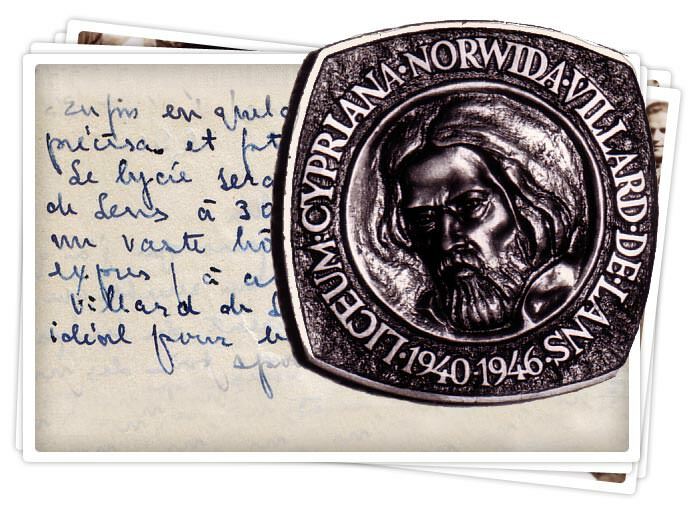 Cyprian Norwid was not selected at random to be the Polish High School’s spiritual patron; he was chosen deliberately because of the desire to associate his name with an establishment laying the groundwork for the nation’s future, based on order, discipline and shared efforts.